Praising Kids: “Good Job!” Doesn’t Cut It Anymore, Part One discusses the problems with over-the-top, glowing praise that focuses on stroking your child’s ego instead of constructive praise that teaches him what it means to do a good job. By focusing on a child’s efforts, not on the child himself, you help build a child’s self-esteem. Praise is good if it's realistic. When praise is consistently reality based, you give your child a fair yardstick with which to judge himself. Praise is good if it's earned. 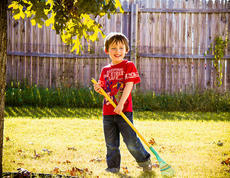 “The yard looks wonderful; you did an excellent job of collecting all the leaves!” Or: “Thank you for helping clean up the corner of the garage, it looks really organized and tidy thanks to you.” Earned praise reinforces your child’s effort and is encouraging. Praise is good when it's specific. The more specific, the better. Specifics are more instructive than blanket praise; specifics teach your child that she is in control of what she can accomplish. It also helps keep a child from believing that he is infallible which in turn will prepare him future criticism, disappointments or losses. Praise is good used sparingly. When you repeat a compliment too frequently, constant, arbitrary praise gets tuned out in the same way that yelling does. So if the right thinking is to moderate praise, how do you make your child feel valued? How do you build his self-confidence? You are praising the process, not the outcome. You are making her responsible. Your undivided attention is worth more than platitudes shouted from another room. Showing an interest in what’s he’s interested packs more of a punch than simply saying, “What a fabulous collection.” It positions your child as an expert — what a confidence boost! 3.) Listening. Most of us are over-scheduled and distracted — often too distracted to give children what they need. They need you to acknowledge them and give them an honest assessment of what they’re doing. Take time to listen, and make sure your children know you’re listening. Listen to complaints and be empathetic. Don’t immediately take your child’s or the teacher’s side, for instance. Hear his point of view. Allowing your child to explain tells him you value his point of view and observations. Being heard is a powerful motivator. You are teaching your child to internalize her abilities and to eventually be able to evaluate herself accurately. Reliving bright moments reminds children of their “strong suits.” You are telling your child she has something worthwhile to offer and share with you. Showing a genuine interest allows a child to relive accomplishments—and this kind of response can cultivate diligence and determination. You’re asking about the process—making your child think about how he created his work or tackled a project and what he might do next time. When you combine these techniques and use them regularly, you put your child on a direct, merited path toward self-confidence. Isn’t that what praise is for in the first place?